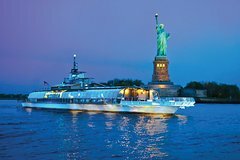 Try something different this November, and spend Thanksgiving in awe, with dazzling up-close views of New York City on this two-hour cruise down the Hudson River. Enjoy a leisurely cruise with stunning views of the Empire State Building, Brooklyn Bridge, the Statue of Liberty and more. Indulge in a delectable plated Thanksgiving meal with live DJ and quality time spent together combine for a simply breathtaking experience you’ll remember for years to come. Head to Chelsea Piers on the west side of Manhattan to board the Spirit of New York for what is to be memorable afternoon on the water! Upon boarding our host will show you to your table on one of our climate controlled decks on this all-glass, European-inspired boat. Enjoy a mouth-watering traditional Thanksgiving meal, such as roasted turkey breast and herb stuffing! While you dine, enjoy the unobstructed views of the city from the panoramic windows. Dance the afternoon away on an enticing dance floor and a DJ playing a variety of hits! See sample menu in itinerary.